"I taught my children this recipe by singing along to Scarborough Fair by Simon and Garfunkel: Parsley, Sage, Rosemary and Thyme, great herb stuffing seasonings. If you can get savory from the Atlantic provinces to green your chicken; it would be the best. My father was a Newfoundlander and swore by their savory." Stir together onion, celery, bread, pepper, parsley, sage, rosemary, thyme, and celery salt in a large bowl; pour melted butter over bread mixture and stir to combine. Spoon stuffing into the cavities of chicken; place chicken into a roasting pan. Sprinkle chicken with savory; cover with a lid or foil. Bake in the preheated oven for 1 hour. Remove cover; increase oven temperature to 425 degrees F (220 degrees C). Roast until browned and an instant-read thermometer inserted into the thickest part of the thigh, near the bone, reads 165 degrees F (74 degrees C), about 15 minutes. 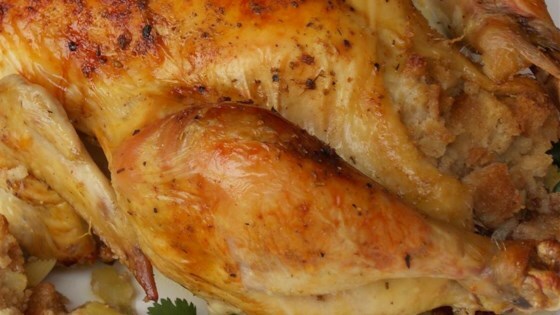 This recipe can be increased for a larger chicken or turkey. Allow 20 minutes per pound at 350 degrees F (175 degrees C), covered, then 425 degrees F (220 degrees C), uncovered, until browned, about 15 minutes more. Place any extra stuffing into a greased ovenproof dish and bake, covered, until vegetables are translucent, about 45 minutes. If the casserole seems dry, moisten with a small amount of chicken stock or melted butter.